The local White Lives Matter group is connected to the Aryan Renaissance Society, a neo-Nazi group. 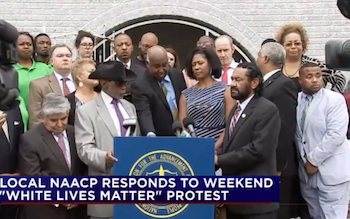 At the NAACP Houston headquarters on Monday, chapter members, community groups and civil rights groups spoke to the public condemning the White Lives Matter protest that took place on Sunday. Dr. James Douglass, the chapter’s president, said the protesters had a right to free speech but affirmed their message is racist. “While they criticize the NAACP for not denouncing a movement that has been productive in bringing awareness to the racial disparity in this country, they themselves espoused totally racist positions,” Douglass said. 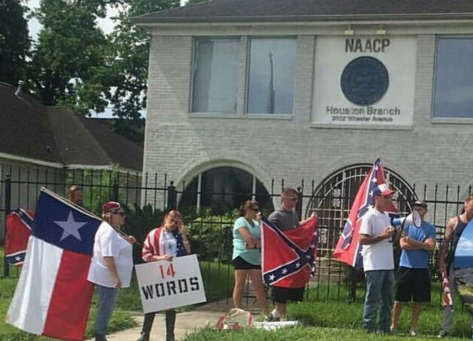 About 20White Lives Matter supporters stood in front of the NAACP’s office Sunday to protest against the organization because it has not denounced the Black Lives Matter movement. The group’s organizer said the movement is violent toward white civilians and white police officers. Some of the protesters were armed with assault rifles and carried Confederate flags. The NAACP said they only found out about the protest the day it took place, and they made sure no one was at the headquarters. According to KPRC-TV,The Anti-Defamation League said the organizers of the rally are tied to the Aryan Renaissance Society, a local white supremacist group. At the rally, a protester held a sign that read: “14 words.” It refers to the 14 words of the white supremacist creed, which calls forthe protection of white people. He also addressed criticism of Black Lives Matter. “We don’t always support all of the things that happen in these movements but we do support the notion that Black lives matter… we want that taken to the four corners of the Earth,” he said. Green said he will contact the Department of Justice to ensure it is aware of the protest. Ashton P. Woods, an activist with BLM in Houston, commented that one of the White Lives Matter protesters was wearing a Trump campaign shirt, and he urged people to vote in the presidential election. “That ought to tell you who to vote for in November,” Woods said. According to the Southern Poverty Law Center (SPLC) White Lives Matter is “a small but virulent movement” and its “main activists, to put it plainly, are unvarnished white supremacists.” The Texas-based Aryan Renaissance Societyhas described itself as the leading force behind the White Lives Matter movement. The group’s website describes the movement as “dedicated to promotion of the white race and taking positive action as a united voice against issues facing our race.” Itwrites that issues including homosexuality, mixed relationships and illegal immigration are unraveling the nation. Two of the major issues White Lives Matter organizers said they have with the Black Lives Matter movement are perceivedanti-white and anti-police sentiments. In a statement on BLM’swebsite, “11 Major Misconceptions About the Black Lives Matter Movement,” those issues are debunked. “The statement ‘Black lives matter’ is not an anti-white proposition. Contained within the statement is an unspoken but implied ‘too,’ as in ‘Black lives matter, too,’ which suggests that the statement is one of inclusion rather than exclusion.